Dante Terrell Smith (born December 11, 1973 in Brooklyn, New York, United States), now known by the stage name Yasiin Bey (formerly Mos Def), is a Grammy Award-nominated rapper and actor. He now works under the nom de plum Yasiin Bey, and has performed under the aliases Mighty Mos Def, The Freaky Night Watchman, Boogie Man, Black Dante and Pretty Flaco. He began rapping in a group called Urban Thermo Dynamics in 1994, and then formed the duo Black Star with Talib Kweli in 1998. As a solo artist he has released the albums Black on Both Sides in 1999, The New Danger in 2004, True Magic in 2006 and The Ecstatic in 2009. Initially recognized for his musical output, Mos Def's screen work since the early 2000s has established him as one of only a handful of rappers who have garnered critical approval for their acting work. Mos Def began his performing career on the television show The Cosby Mysteries in 1994. In 1994, Mos also began his music career, forming the short-lived group Urban Thermo Dynamics (UTD) with his younger brother DCQ and his younger sister Ces. Despite being signed to Payday Records, the group only released two singles and the group's debut album, Manifest Destiny, did not see the light of day until 2004 when released through Illson Media. In 1996 he emerged as a solo artist, working with De La Soul and Da Bush Babees before releasing his own first single, "Universal Magnetic" which was a huge underground hit. After signing with Rawkus Records, he and Talib Kweli released a full length album under the band name Black Star, entitled Black Star. It was released in 1998, with Hi-Tek producing most of the tracks. Mos Def released his solo debut, Black On Both Sides, in 1999. Filled with tracks raving about his hometown, Brooklyn and his love for hip-hop, Black on Both Sides also deals with racial profiling of Black men in America, with the track Mr N**ga. Mos Def was also featured on Rawkus' influential The Lyricist Lounge and Soundbombing series compilations. After the collapse of Rawkus, Def along with Kweli signed on to Interscope/Geffen Records, who released his second album The New Danger in 2004. In early 2005 Mos Def was rumored to join Jay-Z's Roc-A-Fella record label, but this was later denied by the artist himself claiming "Jay-Z and Roc-A-Fella would never allow me to release songs I plan on putting out there. I ain't down with that commercial non-sense. I'm about to deal with the fake with my next album, from George Bush to 50 Cent." But, after making that comment, Mos Def was featured rapping on a SUV commercial, endorsing the GMC Denali. Mos Def is projected to release his last solo album on Geffen Records, The Undeniable Free Flaco in early 2006. His 4th studio album The Ecstatic was released June 9, 2009 on Downtown Records. It serves as Mos Def's second highest charting album to date. Upon its release, The Ecstatic received general acclaim from most music critics, and it earned Mos Def a Grammy Award nomination for Best Rap Album. Rolling Stone magazine named it the seventeenth best album of 2009. The artistic boundaries of hip-hop and rap music had been redefined by artists such as Brand Nubian, De La Soul, and Public Enemy, whose music was more thematically sophisticated and socially conscious than that of their predecessors. By the early 1990s however, this brand of rap had been eclipsed in popularity by gangsta rap. Socially aware rap music (alternative hip hop) has experienced something of a renaissance in the late 1990s and now the 2000s, in part due to artists such as Mos Def, Talib Kweli, Common, The Roots and others. "Mos Def & Talib Kweli Are ? Blackstar" Mos Def's collaboration with Talib Kweli was released during the aftermath of the deaths of 2Pac and The Notorious B.I.G. sparking a rebirth of "aware" and "intelligent" hip-hop. Def's music often references his Islamic faith and his contention that black artists receive little credit for their role in the birth of rock and roll music. The lyrics would seem to have chafed with higher-placed executives, who made Mos take the song off of later releases of the album, supposedly for "sample clearance issues". In September 2005, Mos Def released the single "Katrina Clap" (utilizing the instrumental for Juvenile's "Nolia Clap"), a critical reaction to the lack of response by the Bush administration to the Hurricane Katrina disaster. He probably chose the "Nolia Clap" instrumental because the rapper Juvenile hails from New Orleans, and the song was a hit in the New Orleans area before the hurricane. Mos Def also collaborated with Kanye West on West's track named "two words" and appeared in the music video. The first years of the 2000s have established Mos Def as a notable actor. His performances in Brown Sugar, Monster's Ball, and the HBO made-for-TV film Something The Lord Made have been particularly acclaimed by critics. Having been nominated for several awards, Mos finally broke through, winning Best Actor, Independent Movie at the 2005 Black Reel Awards for his portrayal of Sgt. Lucas in The Woodsman. He also landed the role of Ford Prefect in the long-awaited 2005 movie adaption of The Hitchhiker's Guide to the Galaxy. Notably, in 2002 he played the role of Booth in Suzan-Lori Parks' Topdog/Underdog, a Tony-nominated and Pulitzer-winning Broadway play. He has also been a musical guest and participated in many skits on Comedy Central's Chappelle's Show. In 2004, he hosted the MOBO awards in London, after the original presenter, Pharrell Williams pulled out at the last minute. He has been the host of the award-winning spoken word show Def Poetry Jam since its inception. The show's sixth season aired in February 2007. * The Hitchhiker's Guide to the Galaxy (2005). 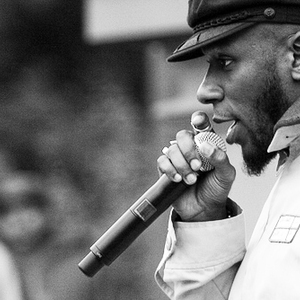 In September 2011, Mos Def announced that he planned to use the name Yasiin Bey instead of Mos Def beginning in 2012.